We were impressed with everyone we interacted with at Horizon, especially our contact person named Mike. They finished the project before estimated time and there were no extra charges for anything! We would recommend this company to our family and friends. Frequently a home renovation is not for the faint-of-heart. There are countless general contractors to choose from, some first-rate and some unscrupulous, and which one to hire is often the biggest unknown factor in a successful execution of transforming an idea into fruition. In my case I could not be happier. Mark Besnos, his wife Enna and all the team at Horizon were absolutely the best. Having done many a previous renovation on properties over the years, I can truthfully say that Mark's diligence and demand for perfection overseeing my project is something I've seldom witnessed before. He is more than a simple "hammer and nails" contractor: Mark is a symbiosis of one part architectural engineer with the aesthetic eye of an interior designer. 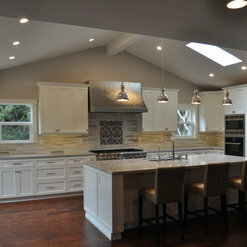 With his immense help we were able to harmoniously blend the various colors of granite, travertine tile, cabinetry and backsplash, updating a tired mid-century ranch home kitchen into a Tuscan showplace. Horizon Construction & Remodeling in 2018 lied about getting City inspections done, damaged my home and covered up the damage, and left dangerous conditions throughout my home, leaving myself and my family at risk. For example, just some of the things Inspectors found: sharp roof shingles unattached on my roof which could have fallen and cut us; they left exposed electrical wiring in the attic = potential fire danger; extremely hot pipes not insulated, which could have burnt us, and more. The City is making me remove construction Horizon did because they lied about getting approval. DO NOT HIRE THEM. They are a dangerous company. They also gave a portion of the remodel to another general contractor (not as a subcontractor) without my approval. Horizon Construction (Mark Besnos) did not supervise this other contractor, who’s license has been suspended and is being prosecuted by the California Attorney General’s Office. All of this can be confirmed. This was a big project and Horizon Construction & Remodeling took my money and have left my entire family devastated by the amount of damage they did to our home. We are really sad to read about this customer review. Our company goal is always to provide good service and quality work. This was our mission for all those years and will be for the years to come. 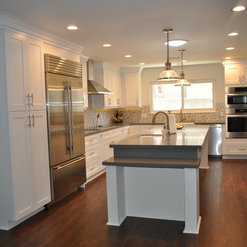 This job was performed pursuant to plans approved by the City of Tustin and provided to us by the customer. The customer has since indicated that she was not satisfied with the plans for the project, though we did not recommend the planner or decide what would be in the plans. 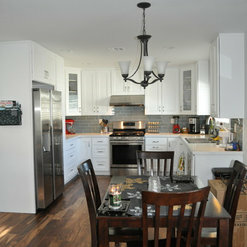 This customer did not allow us to perform final corrections or obtain final approvals from the city. We offered to make any final corrections, and we remain available to resolve any client concerns. If any existing or new customer has additional questions or needs to see additional information about our services, please contact Horizon and ask for Mark the owner; He will answer all questions and provide information as needed. 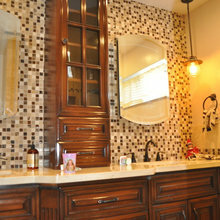 We just completed our remodel of two bathrooms with Horizon Construction. We are very happy with the final product. The work was completed on a timely basis with great communication regarding scheduling, problem solving and attention to any issues that came up. We did have a few issues that needed some attention, but they were completed to our satisfaction. I was very nervous when we first started the project because I am very detail oriented and was afraid the work might not meet our expectations- but it most certainly does. David was our project manager and always responded back to any issues that came up on a very timely basis- always available via phone or email, even on weekends. The office staff was equally responsive, and that made this project so much easier to deal with. We did have a little delay due to the rainy weather over the last couple of months, but other than that, someone was here working pretty much every day since our project started the first week of January . 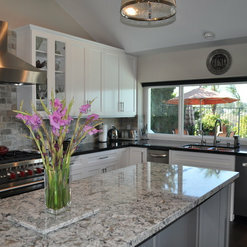 Very happy with our choice of Horizon and highly recommend them for your remodeling needs. The team at Horizon Construction & Remodeling has given us the master suite of our dreams! My wife and I love our mid-century house, but the master bathroom left a lot to be desired. Our project manager, Mike, helped us maximize the space by borrowing from a largely unused kitchenette area and was able to include every single one of the custom cabinets, appliances, and fixtures we set our hearts on. Now we have a luxurious, spacious bathroom and a lovely bar area with plenty of storage that will be excellent for entertaining guests. 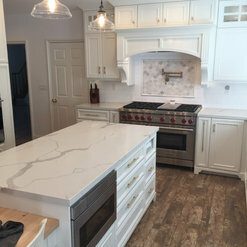 Although there are always some complications in a remodel this large, the whole process went very smoothly and Horizon took care of us at every step - we were always left feeling our home was in the best hands. Thank you so much for helping us fall in love with our house all over again! From the very first phone call I made to Horizon I felt valued as a client. The office staff was always kind and helpful. Our project manager, David, was easy to work with and was always responsive to any questions or concerns. He stopped by frequently to check the progress throughout the project and kept us informed of the next phase and work scheduling. 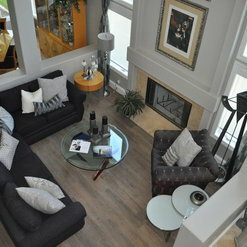 All the tradesmen involved were professional, respectful of our home, great to talk with and did an excellent job. Any remodeling project can be stressful, but I believe that the service we received from Horizon made the process as smooth as possible. 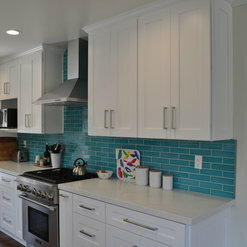 We love our beautiful new kitchen and bathroom. 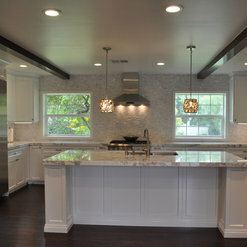 I would highly recommend Horizon Construction and Remodeling for any home project and would certainly use them again. Thanks for the awesome review! We work hard to meet expectations like yours, and we’re happy to hear we hit the mark for you. Cheers! Mark Besnos and his crew at Horizon Construction and Remodeling did an awesome job on all of my remodel projects in my home. I especially like that if there is something that you don’t quite like they will fix it for you right away. I recommend them because I love how everything turned out and I will use them again for my next project! We count ourselves lucky for customers like you. I appreciate your positive feedback about our company. We do take pride in our work. 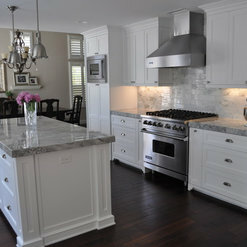 If you’re in need of any other remodeling projects, don’t hesitate to call us. 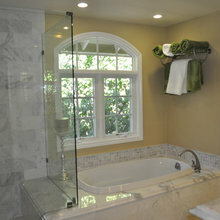 I interviewed multiple contractors to complete a full bathroom remodel for 3 bathrooms. I ultimately chose Horizon because I knew they would be the right fit for the project I was undertaking. 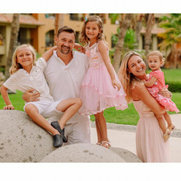 They are a small family owned business that has the customer’s satisfaction in the forefront of their minds. We agreed that we would complete the project in two phases. 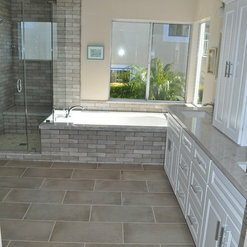 We completed a hall and master bathroom remodel first with the third bathroom to take place after the first of the year. Both Horizon and their subcontractors are available to answer questions and assist with any decision making you may need or ideas to make your project have an outcome that you are 100% satisfied with. 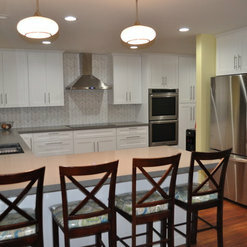 The workmanship, timeliness and cleanliness of each subcontractor was impeccable. 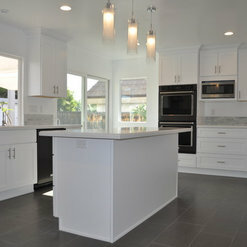 I would highly recommend Horizon for your next remodel. Thank you for the kind words! We’re so happy your projects went so smoothly. We’d love to continue providing great service to awesome clients like you so your feedback is much appreciative ! I started this bathroom remodel with a different contractor - but it didn’t go well. So I hired Horizon Construction & Remodeling and my bathroom is absolutely stunning. I will recommend them to friends and family. David my project manager was great, he always assured me that all will be taken care for me and I actually could sleep good at night. And I did ! I’m very happy ! Any questions that come out were addressed in a very timely manner. Which made me feel very comfortable. Now the project is complete it looks absolutely wonderful beyond my expectations My family and I really love it! Thank you for your positive comments. I am so glad to hear that you enjoyed working with us! I hope your next project is just around the corner. Call us if there is anything we can help you with.